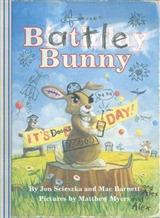 Clever science experiments, funny jokes and robot hijinks await readers in the first of six books in the New York Times bestselling Frank Einstein chapter book series from the mad scientist team of Jon Scieszka and Brian Biggs. The perfect combination to engage and entertain readers, the series features real science facts with adventure and humour, making these books ideal for STEM education. This first installment examines the science of "matter." Kid-genius and inventor Frank Einstein loves figuring out how the world works by creating household contraptions that are part science, part imagination and definitely unusual. In the series opener, an uneventful experiment in his garage-lab, a lightning storm, and a flash of electricity bring Frank's inventions - the robots Klink and Klank - to life! Not exactly the ideal lab partners, the wisecracking Klink and the overly expressive Klank nonetheless help Frank attempt to perfect his inventions.. . . until Frank's archnemesis, T. Edison, steals Klink and Klank for his evil doomsday plan! Integrating real science facts with wacky humour, a silly cast of characters and science fiction, this uniquely engaging series is an irresistible chemical reaction for middle-grade readers. With easy-to-read language and graphic illustrations on almost every page, this chapter book series is a must for reluctant readers. The Frank Einstein series encourages middle-grade readers to question the way things work and to discover how they, too, can experiment with science. 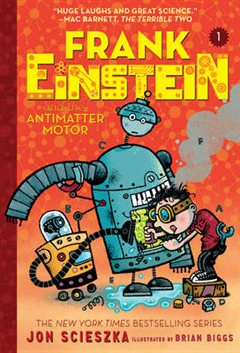 Read all the books in the New York Times bestselling Frank Einstein series: Frank Einstein and the Antimatter Motor Book 1, Frank Einstein and the Electro-Finger Book 2, Frank Einstein and the BrainTurbo Book 3, and Frank Einstein and the EvoBlaster Belt Book 4. 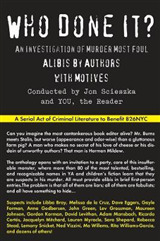 Visit frankeinsteinbooks.com for more information.